Cumberland Self Storage at 197 Dexter St. Located at the corner of Dexter St. and Curran Rd., Extra Space Storage serves Cumberland residents near Valley Falls and Central Falls. Locals will recognize our facility across the street from Robin Hollow Pond a few minutes from the Rhode Island/Massachusetts border. 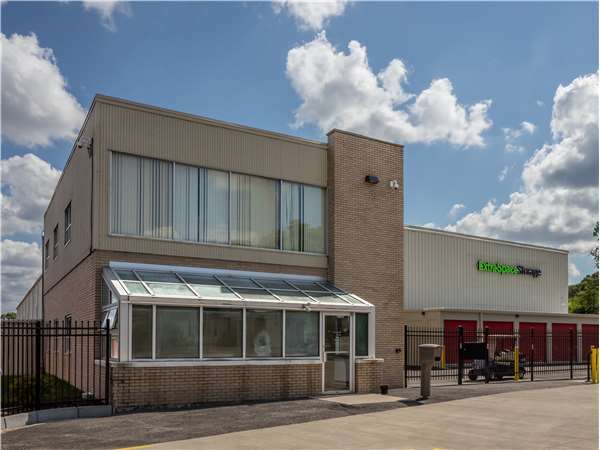 Extra Space Storage on Dexter St. offers a large selection of storage units, climate-controlled storage, drive-up access, and exceptional security. We're the storage partner for you in Cumberland! We have the space you need! Our Cumberland storage facility offers units ranging from 25 square feet to 300+ square feet with features like indoor access, drive-up access, and more. The security of our customers is our top priority. That's why our Dexter St. storage facility utilizes an on-site manager, 24-hour video surveillance, and electronic gate access. Concerned about temperature-sensitive items? With climate-controlled storage, your storage unit stays comfortably between 55? and 80? to prevent damage caused by extreme heat and cold. Need secure vehicle storage in Cumberland? Extra Space Storage offers enclosed, drive-up access units and outdoor parking spaces that can handle cars, motorcycles, boats, and RVs. Extra Space Storage not only provides high-quality storage at affordable rates, but we also offer excellent customer service. Our friendly, professional staff maintains a clean, secure facility at all times and is more than happy to help with whatever you need. Contact us today to reserve a storage unit in Cumberland! Clean, well lit, excellent customer service, tons of options for space. I feel safe going by myself, and the staff is phenomenal. Seamless transactions monthly and no sketchy contracts, it's all explained so well. I wish I had found this place years ago. Friendly staff, informative, easy to rent unit, staff discussed needs and showed unit options to give us the best fit. Gave us tips for packing unit to avoid common issues. Ensured that we understood how to access unit. Great service. Absolutely flawless! After researching many other facilities, Extra Space Storage was just the perfect location for my storage needs, no mold, no bugs, climate control units and even the side with no climate control is just fine! Never gets too cold, I love the facility and the location, if looks and feels safe, and it is very close to the highway I 95 and Route 1. Horrible. Our stuff was moldy and nothing went it wet or dirty. The insurance is a joke. We made every payment. Now they refuse to let us move out and keep charging. Stay far away. ExtraSpace Storage is hands down the best customer service, cleaner spaces, and reasonable prices around. They'er first month free promotion is insane, you will not be disappointed. Great facility, clean and well maintained. Employees are super helpful and friendly. The price is very competitive compared to other self-storage companies. Security of my stored belongings seems like top priority with this company. Easy and secure access to the property and facility. If you are a storage rookie Extra Space Storage is the place to go! We found Gary to be very friendly and helpful. He patiently answered all of our questions and walked us through everything without missing a detail! Manager is super friendly and respectful place is clean and safe cameras all around, to assure you that your belongings are in good hands. Great to work with! Will definitely recommend and use in the future. Excellent storage facility, clean & with addequate security features. Friendly staff provided helpful information regarding storage space available for my needs. Facility was neat, clean & with good access. Gary was fantastic and very detailed. He gave me a tour of the property and I left there without any questions. Very happy with my unit so far and the service. Dave as well as all the other employees go above and beyond what is expected to help in any way as well as answer any questions that may arise. They are friendly and extremely caring. The facility is extremely clean and convenient. I highly recommend this facility!! Great Staff especially Dave and the Assistant Manager, great and knowledgeable, very helpful! The site managers were very helpful, kind, and polite. They were incredibly thorough with all the information they provided me. I highly recommend this facility. It’s clean, climate controlled, and there are plenty of surveillance cameras. I feel that my possessions are in great hands! Their customer service was excellent, the facility was clean and secure. I would recomend extra space storage. They go above and beyond in customer service. Excellent customer service, and super clean. We used them before for a year, and always felt our belongings were safe and secure. Dave and Mike were very helpful. Units are clean and very secure. Camera's are every where. I would recommend this location. 197 Dexter st in cumberland. I toured 4 other facilities within a 10 mile radius of this location. Don't bother, they have no competition. They are leaps and bounds above the others and affordable! Dave was very professional, personable, and helpful. This was my first time ever renting a storage unit and all my questions were answered. I liked how Dave took me on a tour of the facility and showed me how to access my unit. He went over all the contract items and I understood everything he talked to me about. Great price and will recommend! Great deals on line, the process was simple and fast to reserve a unit. They contacted me right way to confirm reservation and the staff are the nicest and friendliest I have ever encountered when renting storage space. I recommend this location for storage. You will have a seamless transition, from having no place to store your goofs to having a roof over them. Very professional and very competitive prices. This place is far above others. Customer service is excellent. I feel secure in my decision to store my valuable vehicle here. I have used Extra Space Storage on two separate occasions and I have had a great experience with the staff and facilities both times. I used the Millbury, MA location and recently the Cumberland, RI location and both facilities are clean and well secured. They also offer convenient hours for access to the storage unit. I will use Extra Space Storage again if the need arises. The location is great! Clean and affordable. Dave was great at explaining everything and made me feel at ease. I would highly recommend this storage company. Clean facility, decent prices. Staff did a good job getting me setup. Drive south on Hines Rd. Turn left onto High St. Turn left onto Dexter St. Our facility will be on the right after Curan Rd. Drive north on Broad St. Turn right onto Mill St. Turn left onto High St. Turn right onto Dexter St. Our facility will be on the right after Curan Rd. Drive southwest on Newport Ave. Pass CVS and continue onto Highland Ave. Enter Rhode Island and continue onto Dexter St. Our facility will be on the left. Drive southeast on RI-123. Turn left at CVS onto Broad St. Turn right onto Dexter St. Our facility will be on the right after Curan Rd.